When one pushes synthetic sounds to the realm of unreal and back again, what else is left to do? Brian Eno’s work behind an engineering board had taken him far and far out by 1990… The exciting world music he had envisioned did not match the world music found in the New Age marketing-niche of the previous decade, and albums bearing his name seemed to carry his signature thumbprint, even when thoughts of strong structure more or less faded away with each LP. 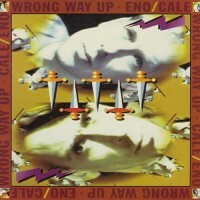 On “Wrong Way Up” the studio still acts as the lead instrument, but song structures make a return. And who better to help Eno return to strange but impactful songwriting than musical-foil John Cale? All sorts of beats and chirps assembled throughout these tracks are meshed through Cale viola, not to mention any sort of instrument the duo could get their hands on. What they come up with most of the time are musical figments riding chopped and screwed grooves. Lyrics are not esoteric but definitely familiar to fans of either Eno or Cale; impressionistic views presented in a pop context. The results can be surprisingly affecting like on “Cordoba” when repetitious mentions of buses and stations highlight an obvious separation, or on choice single “Spinning Away” with it’s constant citing of colors and shades.